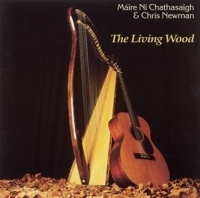 In 1988, Máire Ní Chathasaigh and Chris Newman released 'The Living Wood', their critically acclaimed first album together. It originally appeared on the American Green Linnet label, then on Black Crow. The licence reverted to Old Bridge Music in 1994 and we were delighted to be able to re-release it on Old Bridge Music. The excellent Bryan Ledgard redesigned the sleeve, and Chris digitally remixed it for optimal sound quality. (a) From George Petrie: Ancient Music of Ireland Dublin, 1855. (b) Learnt from the flute playing of Johnny McCarthy of Cork. From S.A. and P. Thompson: The Hibernian Muse; a Collection of Irish Airs, including the most Favourite Compositions of Carolan, the Celebrated Irish Bard London c1786. Probably composed in honour of Lady Bridget Burke, second daughter of the ninth Earl of Clanricard, who married Richard, the ninth Viscount Dillon in 1720. Her sister Lady Laetitia Burke, and her brother the Hon. Thomas Burke, were similarly honoured by Carolan. The Dillon family seat was at Lough Glynn, Co. Roscommon. Richard’s grandfather Theobald, the seventh Viscount, raised Dillon’s Regiment in 1688 - one of the units which, disembarking at Brest on the first of May 1690, were the first elements of the famous Irish Brigade to land in France. Theobald was killed fighting for King James the Second at the Battle of Aughrim, and his wife was killed a few weeks later, on the seventh of September 1691, “by the second bomb thrown into Limerick by King William’s Army.” Our Lady Dillon died, presumably in her bed, in 1779, her eighty-ninth year. Two traditional American fiddle tunes, the first of which comes from the playing of Béla Fleck. Chris heard the second tune several years ago on an album of the same name by the American guitarist Norman Blake. "With sighs and tears this Damsel said,‘If you resolve to go to sea, In Sailor’s Robes I’ll be array’d And freely go along with thee." ...Cried he, "My Dearest, stay on land, Such idle fancies ne’er pursue. Thy soft and tender milk-white hand Seaman’s Labour cannot do." Thus runs a ballad of about 1690, entitled The Undaunted Seaman, who resolved to fight for his King and Country; together with his Love’s Sorrowful Lamentation at their (sic) Departure, (published in W. Chappell and J. Ebsworth, The Roxburghe Ballads, 9 vols., Hertford, 1871-1899), which seems to be the source of all the later songs, variously entitled Adieu Lovely Mary, Fare Ye Well Lovely Nancy, etc. Máire learnt the present song from Séamus Mac Mathúna. (a) Learnt from the playing of the legendary Sliabh Luachra fiddle-player Dennis Murphy. The Walsh in question was apparently Philip Walsh, a fiddle-player from the same area. Denis’s version has here been modified somewhat by reference to the quite different setting of his sister Julia Clifford. (b) A tune associated with the late singer and fiddle- player Joe Holmes. (a) A popular tune, published in Francis O’Neill’s Music of Ireland, Chicago 1903. (b) From George Petrie: Ancient Music of Ireland Dublin, 1855. (c) Learnt from the concertina player Michelle O’Sullivan; she in turn learnt the tune from Ann Sheehy and Nicky McAuliffe of Co. Kerry. A tune not normally associated with the Irish harp. Bill Keith, one of the more adventurous American banjo players, has been largely responsible for the current interest in the chromatic style of banjo playing, and this composition of his is a good example of that style. (a) A fine old Munster love song. (b) A traditional Basque waltz which Chris learnt in Hasperren, a small village in the French Basque Country. The first of these tunes was composed by Bobby McLeod from Tobermory on the Island of Mull in the Inner Hebrides. The second is from Cape Breton Island. The last is taken from Petrie; it was sent to him by James Fogarty of Kilkenny. It’s an attractive variant of The Washerwoman, that ancient lady who, ever since she first achieved notoriety, has consistently confounded all predictions of her imminent demise. (a) A salutary tale of desertion and betrayal, or of the triumph of youth over age, depending of course on your point of view. An old man and his very young wife sally forth one day and encounter a young wizard on the road. On discovering that the vision of beauty which confronts him is not the old man’s daughter but his wife, he demands her with menaces. The old man suggests that the girl be allowed to choose for herself. She chooses to abandon him and he returns home disconsolate. (b) A piping reel which Máire always associates with the playing of Willie Clancy. The mazurka is a traditional Polish round-dance, named after the Mazurs who lived on the plains around Warsaw. It gradually spread over Europe, reaching Britain and America in the early nineteenth century. The London Observer of the 25th April 1830 gives a description of it as just “introduced, or intended to be introduced into this country”. It reached Ireland shortly afterwards, and took such firm root in the County of Donegal in particular, that it was there perceived to be no more foreign than the reel or the jig. Máire leant this tune many years ago from the fiddle playing of Mairéad Ni Mhaonaigh and her father Francie, of Bunbeg, Co. Donegal. The first of these tunes was composed in the form of a reel by Aly 8am, in honour of Bob McQuillan, a friend of his from Connecticut. We play it as a hornpipe. The second tune is associated with the Dublin melodeon player Sonny Brogan. The polka was a Bohemian round-dance which originated early in the nineteenth century, and by the 1840s had spread over Europe like an epidemic. It became extremely popular in the south-west of Ireland, in the same way that the mazurka did in Donegal. These examples were learnt from accordeon player Pádraig Moynihan of Kerry. All titles traditional arranged by Máire Ni Chathasaigh and Chris Newman. © Máire Ni Chathasaigh and Chris Newman (MCPS) except (*)’Bill Keith (ASCAP), (**) Bobby McLeod and (***) Aly Bain. Special thanks to Simon Mayor, Mairéad Ni Chathasaigh, Aly Bain, Anna Addis, Arty McGlynn, Helen Davies, Tina McCarthy of WEA, Hilary James, Helno Sheehy & Dermot McLoughlin whose various contributions helped make this record possible. The harp used on this recording was made by Kunzo Aoyama; the guitar is a 1929 Martin OM-18; the mandolin was made by Mike Vanden.